Another day, another potential VR advancement ready to make the virtual world a more immersive, lifelike experience. Today it’s the turn of haptic feedback, with a research team at Germany’s Hasso Plattner Institute looking to make VR more immersive with the use of electrical muscle stimulation. While this might sound particularly unpleasant, it’s completely safe and allows users to feel virtual objects as if they were real when sticking out their hands in the virtual space. 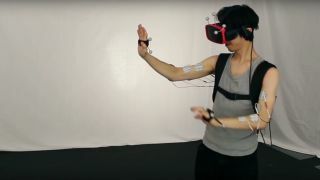 Although nuances still need to be worked out, the research team headed up by Dr. Patrick Baudisch has managed to allow VR headset wearers to feel heavy objects as if they were really there using controlled muscle responses in four different muscle groups. By triggering a reaction in the opposition muscles for a desired movement, it can create a sense of feeling and weight when paired with VR images. “As the shown user lifts a virtual cube, our system lets the user feel the weight and resistance of the cube,” a blog post surrounding the research explains. Things are still in the early stages, however, so unless you’re happy carrying a box or interacting with a wall placed in the middle of your virtual environment, you’re going to be left wanting a little while longer. It’s also not yet the most seamless technology, with the necessary electronic slotted into a small backpack that must be worn alongside a traditional VR headset. That’s not where the body adorning electronics end either. The backpack is then connected to a range of sensors attached to the wearer’s arms in order to monitor and stimulate the muscles. Although currently wildly inconvenient, fiddly and no doubt ridiculously expensive, the possibilities for such technology are vast. To further the viability of the tech, the research team is currently testing its VR-friendly haptic systems in a pair of user studies.